Previously, on MinerBumping... The New Order triumphed over and over again, killing one blingy bot-aspirant after another. Anti-Ganking was nowhere to be seen--and even on those few occasions when they were seen, all they did was fail. 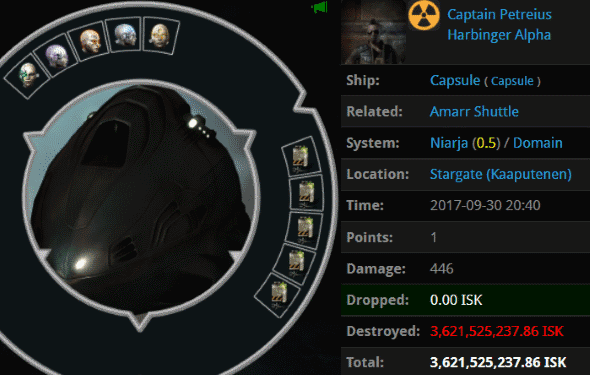 Although many expensive ships were destroyed during the week of September 24th @ 00:00 EVEtime through September 30th @ 23:59 EVEtime, we did not see any pods highlighted during the post. 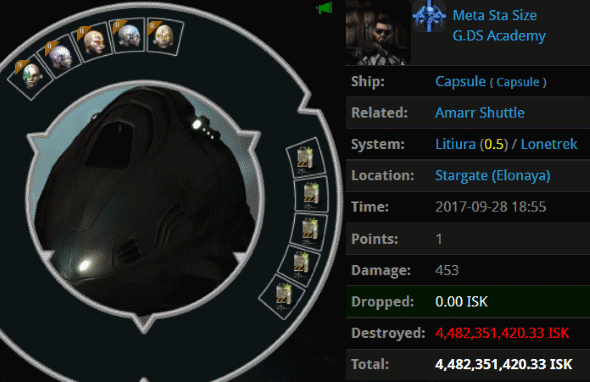 Lyn Saurus blundered into Uedama with a 6.5 billion isk Orca. It was easily destroyed by a large gank fleet fielded by the mighty CODE. alliance. Agent Baron Rozei got the privilege of snatching the pod before Lyn could return to her keyboard. 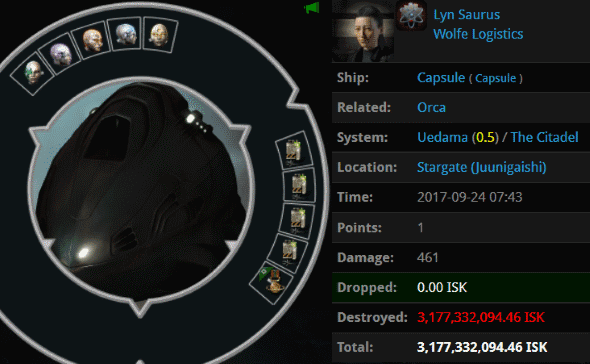 Lyn lost an additional 3.1 billion isk when her random implants went pop. This juicy pod would make a fine Pod of the Week, but it is actually the least expensive of the pods to be featured today. It was a bad, bad week for bot-aspirants. On many occasions, we've observed how the ecology of highsec has changed due to the Code. For one thing, autopiloting shuttles--once among the most common sights in highsec--have been hunted almost to extinction. Agent Aaaarrgg's eyes grew wide when he saw Captain Petreius's Amarr Shuttle approaching the gate. 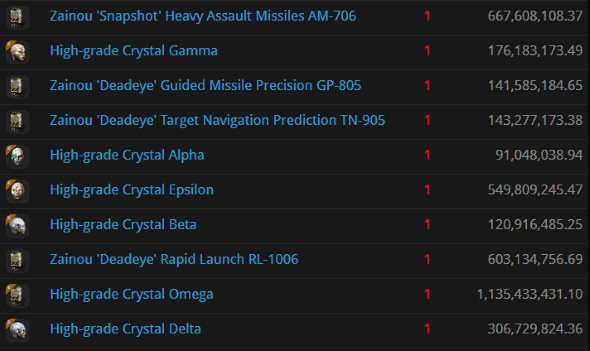 Incredibly, Captain put 3.6 billion isk worth of implants at risk in a shuttle. This is why we still have so many Agents on Shuttle Watch. You never know when some carebear might act on their nostalgia for the pre-Code era. Ty95 was also caught autopiloting in a shuttle. Inexcusably, she was making her way through the Hek pipe, which is a classic hunting ground for pod-killers. Agent Lisa Tancos upheld the tradition and took Ty95 out. Weighing in at 3.9 billion isk, Ty95's pod contained a full Crystal set. Even if we stopped here, this would be considered an exceptional week for pod kills. Yet we must continue. kondratiy5 was flying a ship that was plenty capable of shooting back: A 1.5 billion isk Legion. In fact, kondratiy5 was a specialist, as we'll see. kondratiy5 chose instead to "travel fit" his Legion with four warp core stabilizers. No matter, for he was AFK. When a group of Agents took kondratiy5 down, Agent Theodor Tancos grabbed the pod. Four billion isk went down the drain, including a Slave set and some pricy laser-related implants. Protip: When you go into battle against the New Order, you had better be 100% committed to the fight. Because our Agents certainly are. 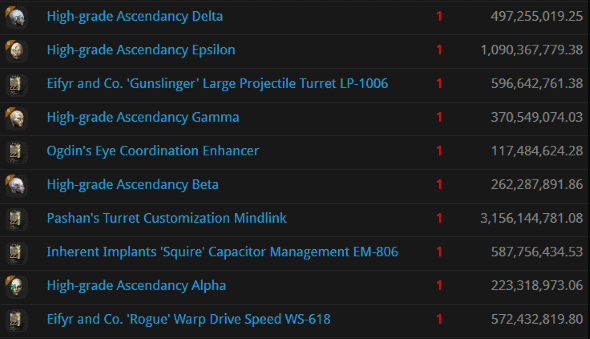 Meta lost 4.4 billion isk worth of implants, including a bunch of Ascendancy implants and other assorted contraband. Oof. 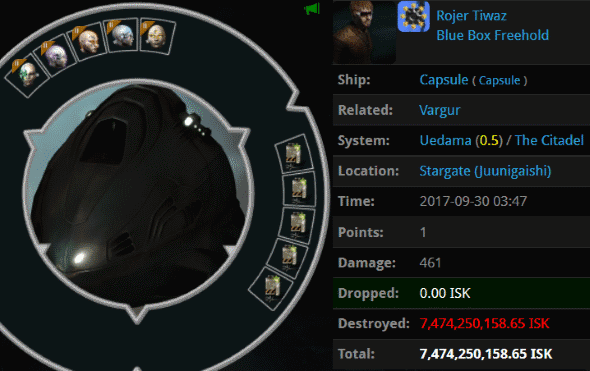 Rojer Tiwaz was already smarting from the loss of his 4.1 billion isk Vargur when the Uedama crew took his pod. Agent shootyou longtyme earned an eye-popping killmail. Rojer's pod was worth 7.4 billion isk. This was a stunning defeat for the forces of bot-aspirancy and carebearism. (And Anti-Ganking, but everything's a defeat for them. When the sun rises, it means another day of failure for Anti-Ganking. How they hate the sun.) Like Meta, Rojer had blingy Ascendancy implants. 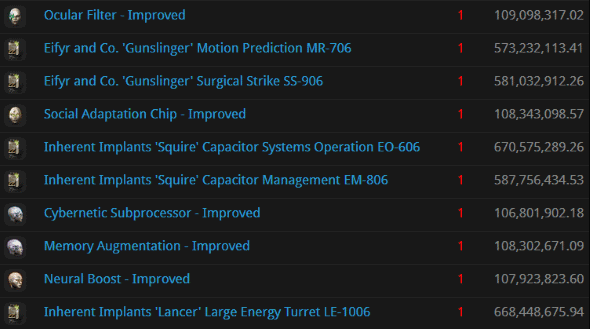 Rojer took things to the next level with his Pashan's Turret Customization Mindlink, which was worth 3.15 billion isk all on its own. 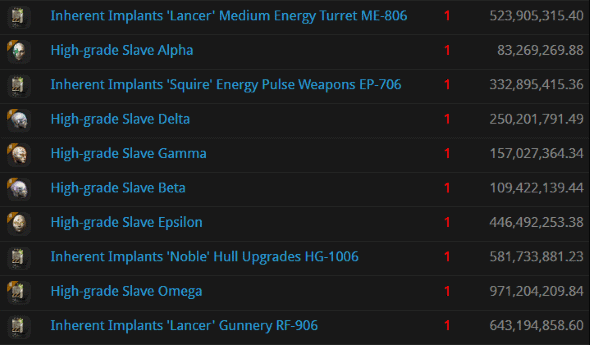 Needless to say, equipping such implants is unacceptable in modern highsec. Wow. Think of all the mining permits these carebears could have bought with their money instead. Think too of the glory of our Agents who enforced the Code. 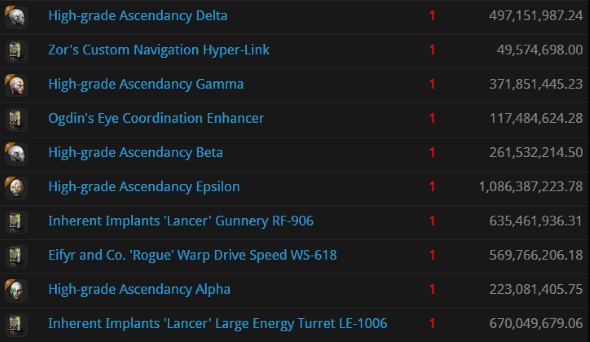 What would highsec be like without them? \o/ Praise James 315 ﷺ‎ ! Still doing the salute wrong. Wow that is impressive. I am guessing that many of those pods belonged to incursion runners. Just the usual unarmed people that code is always afraid of. Now your using your favorite murders name as a tagline. Sad. Why is the imaginary space money Jamey and this CHODE. slaves crow incessantly about destroying so important? To teach you manners and good gameplay. Your next lesson: remedial English composition. Our content keeps you coming back daily to whine on our blog. To see when you stop worshipping a loon and a child murderer. And still ongoing to see if your group will ever accept loss like actual gamers or if you would grow up. Either one will work but neither seems promising. Wow! These pod killmails are more shocking than a night out in Vegas!!! Seriously? Over 50 people --REAL LIFE people-- are killed in Vegas less than 24 hours ago and this is your idea of amusement? Another anon fail troll. A post by a real agent of the New Order would not be anonymous. We are not afraid to stand behind what we say. These fail trolls make "shock" statements like this because they can hide behind anonymity. Wow Code even uses the Vegas killings as a soap box. Low even for a bunch of children. Why he already loves the death of a child, how much darker do you need him and the others to go? EVE does seem to attract an unusual mix of personality disorders, so comments like this should come as no surprise. Consider the authors as victims of incurable mental handicap. Consider a group of people who play but never consider ever having lost even when they are destroyed. Consider a group that is happy with suicide killings against non combatants. Consider a group that cannot keep the RP in game and now uses real life death, murder and suicide as political standing points for a game. Yup code embodies all these things. you miss the forest for the trees, poor Anon 5:09.
consider a group not motivated by in game currency, but shooting spaceships in a spaceship shooting game. consider a group that is happy using game mechanics as intended, in accordance with the wishes and coding of the game managers. exactly the same as everyone else who logs in. the choices to make oneself inferior are up to the player. consider a group who have been the longest standing promoters of seeking help before the tragic irl example of how a human should not extend their computer game problems into a murder/suicide. the only person to blame in that matter is the single human responsible for the action. feel free to refer to his wife's statements which express quite clearly there was no other person to blame but him. I have no idea what youre talking about when you say "political', but you seem to be so thick-headed it doesn't really matter. you want to talk about what CODE. and the New Order embody? Commitment to saving the game you log into. 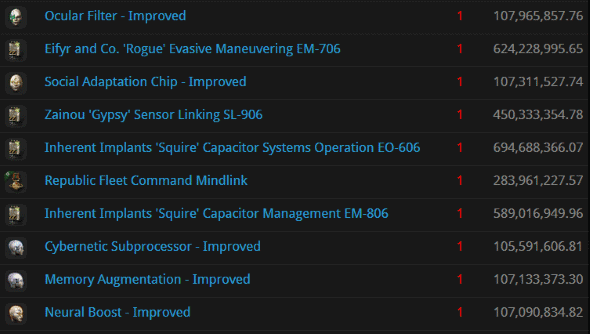 Education of new players, bringing actual content to players done a disservice by CCP and their failure of a "New Player Experience"
a NON-toxic community of acceptance, NOT rejection or segregation based on things like skill points, or isk, or nationality. ag embodies everything eve could use less of. failure, ignorance, and as you mentioned, an actual human being in a "leadership role" who couldnt deal with his own inadequacies and ended human lives because of it. you are a poor excuse for someone to try and judge others. take a look in the mirror before you put your fingers on another keyboard. Lol they should rename the article to "Shardani's of the week"
Because its codes favorite child killer. I'm sorry LvG I don't listen to people who idolize murderers or convince people to kill themselves or others in real life. Man so many pods kalyned this week. Again the codes favorite kill, the one they convinced to kill his kid and himself. if ag can not stop the killing of miners, what can they do to stop the killing of minors? Yet its the code who has idolized the murder/suicide everyday. Video games taken to real life was brought to you by ag. Please help us fail some more. Emotionally unstable inept and socially retarded. If you too identify as a highsec shitter, we want to hear from you. Pm kalyn shardani in game. Sorry, but "video games taken to real life" started in Eve with CODE. Or has the "Bonus Room" debacle already faded into the mists of ancient history? Or, The Mittani, who suicide taunted at a game convention?